If you’re like me and grew up in the 90s, you probably remember grownups watching a little sitcom called Friends. If you’re not like me, you’ve probably seen Friends around on Netflix or maybe in GIFs on the Internet…maybe you’ve even decided to try it out for yourself. Friends is a show about six twenty-something boys and girls living in New York City---their trials, their triumphs, and being there for each other---and I’ll give you five good reasons to give it a shot for yourself. -The characters. 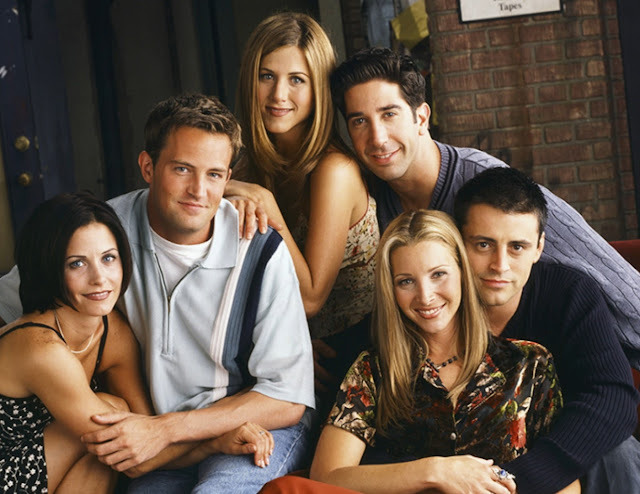 The aforementioned six twenty-somethings are brother and sister Ross and Monica Geller, Monica’s high school best friend Rachel Green, Ross’s high school best friend Chandler Bing, Chandler’s roommate Joey Tribbiani, and Monica’s former roommate Phoebe Buffay. Ross is a dorky and lovable paleontology P.h.D. working in a museum. Monica is a hardworking and all-around top-notch chef slightly obsessed with cleanliness. Rachel is a good-hearted former rich girl trying to find her way through life in the world of fashion. Chandler is an IT specialist in “statistical analysis and data reconfiguration” who is never without either sarcasm or a wisecrack. Joey is an endearing, air-headed Casanova actor with an on-again, off-again relationship with work. Phoebe is a sweet-natured yet tough hippie who works as a masseuse. You get to know these guys over the course of the show so well that they become like family. I know they’re a big reason why I keep coming back. My dad, my brother and I have probably seen this show all the way through together maybe twice or three times. We know when the funny lines and moments are coming, and we still laugh. Heartily. Uproariously. So hard we wipe tears away. -The stories are real. So real that they could have happened to any of us. Ross deals with the aftermath of not one but two divorces and being a father to his young son from his first marriage. Chandler struggles with the problems stemming from being an only child in a family that ended in divorce. Rachel comes from a rich family but decides that she wants to live her own life instead of marrying for money and comfort instead of love. And at least one point in their lives, each of the friends find themselves out of a job. These are all stories we can relate to and just more reasons to feel kinship with these guys. -The romance. Perhaps one of the biggest reasons we keep coming back to watch Friends is to watch these guys fall in love. It’s sweet. It’s hilarious sometimes. It’s rough sometimes. But it’s real. The on-again, off-again relationship between Ross and Rachel is arguably the biggest romance of the series. Ross had a crush on Rachel since the fourth grade, but she never found out until she joined their little circle of friends all grown up. Their road was fraught with pitfalls, fights, obstacles, alternate interests and personal problems, so when the end came, it was all the sweeter. The steadiest relationship (and my personal favourite) is Chandler and Monica. This was a shock and a surprise because no one could have seen this coming. They come together in London at Ross’s rehearsal dinner when Monica is depressed at being mistaken for Ross’s mother, and their “thing” just keeps going even after they return to the States and grows into arguably the strongest pairing on the show. They support each other through their insecurities, and each always has the other’s back in tough times. Both of these relationships—and others on the show—are inspiring because of their humanity and down-to-earth-ness, and they give us hope that we can find such love, too. -It’s a show that families can watch together. Well…families in which everyone is over thirteen, anyway. For a show of this genre, Friends is surprisingly clean with a rating of TV-14, which is the television version of the big-screen PG-13. There’s little to no swearing—for that matter, limited only to use of socially accepted terms. Even the innuendos are relatively mild, stuff that only the adults would get and that fly clean over the heads of the kids and still manage to remain funny. In that respect, Friends is a rare jewel in a sea of sitcoms that are not always conducive to family viewing. Friends—Ross, Rachel, Monica, Chandler, Joey and Phoebe—have a very special place in my heart. These guys made the previous generation laugh and cry, and now my generation is getting to do the same: laugh ourselves silly and watery-eyed at their escapades, their quips, their pranks and jokes; and mourn their losses and movings-on. Friends was and is still one of the greatest shows of all time with some of the best friendships and romances to ever grace our screens. Have you seen Friends? Are you considering it?